Hairballs may be a sign of intestinal problems in a cat. Aaaccckkk. If you’re a cat parent, you probably dread hearing that hacking, retching sound your cat makes before she throws up a hairball — usually at 2 am. Although they’re fairly common, hairballs that occur frequently are not normal for a healthy cat. Cats’ digestive systems are built to handle the hair that gets swallowed during their grooming process. Hairballs — tube-shaped, thick mats of hair covered in mucous — may be a sign of intestinal problems. Cats spend about 30 percent of their waking hours grooming themselves. As they lick themselves repeatedly, cats ingest hair. 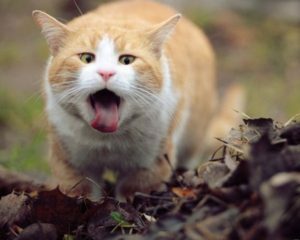 Feline tongues have backward-facing hook-like structures that catch loose and dead hair that your cat then swallows. The hair travels down the esophagus and into the stomach. In healthy cats, the hair continues passing through the cat’s digestive system, along with food, and is eliminated in the feces. When the cat’s digestive system fails to move the hairball through the digestive system, hairballs develop. The hair clumps together in the stomach and doesn’t pass through the intestines. Your cat will usually vomit to get rid of the stomach-irritating hair wad. Because the hair passes through the esophagus on the way out, hairballs are thin and tube-like — not round as their name suggests. 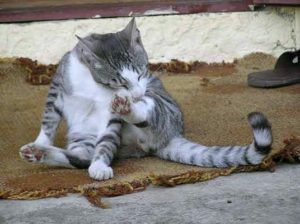 In some cases, hairballs can cause intestinal blockages that prevent cats from vomiting or defecating. A swollen and hard stomach, vomiting, diarrhea, constipation, lethargy and loss of appetite can be signs of a dangerous blockage. Occasional hairballs may not be a problem. Cats may throw up hair and food if they eat too fast, eat outdoor plants or develop a sensitivity to their food. To prevent occasional hairballs, you can feed your cat a flavored petroleum-jelly-based lubricant (available over the counter) that helps move hair through the GI system. Changing your cat’s diet can also help. Adding fiber to your cat’s diet can prevent hair from clumping in the stomach. Ask your vet about the best way to increase your cat’s fiber intake. A specially-formulated diet that contains soluble and insoluble fiber to increase digestive activity is one possible approach. Many cat food manufacturers make “hairball reduction,” high-fiber formulas. Ask your vet for recommendations. Switching your cat’s food to reduce allergens may help. Gastrointestinal inflammation (due to food allergies and/or inflammatory bowel disease) underlies many chronic hairball problems. If over-the-counter limited antigen foods don’t solve the problem, your cat may need a prescription, hypoallergenic diet. Again, talk to your vet for recommendations. Brush your cat every day. The more hair you remove via regular brushing, the less your cat will ingest. If your cat throws up hairballs more than once a month, he may have a serious health issue that’s decreasing motility. For frequent hairballs, take your cat to the vet for an exam. The only way to determine whether a simple change in diet can solve the problem, or if your cat has a more serious medical issue, is to consult your vet. To treat hairballs, your vet needs to identify and treat the underlying medical cause. Your vet will probably conduct several diagnostic tests that may include blood work, x-rays and ultrasound of your cat’s stomach and intestines, and/or endoscopy — using a tiny scope to look inside your cat’s intestines (while she’s anesthetized) and taking tissue samples to biopsy. The bottom line? Unless they happen only occasionally, hairballs should NOT be viewed as normal. Take your cat to your vet for evaluation and treatment. You and your cat will both sleep better!